The human (Homo sapiens) IGH locus is located on the chromosome 14 , at band 14q32.33, at the telomeric extremity of the long arm [2,3]. The orientation of the human IGH locus on the chromosome is reverse (REV). The orientation of the locus has been determined by the analysis of translocations, involving the IGH locus, in leukemia and lymphoma. 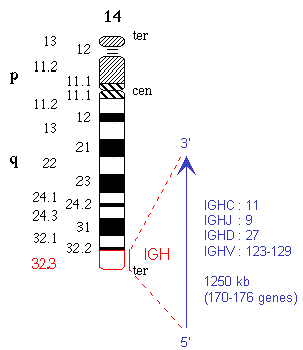 A vertical red line indicates the localization of the IGH locus at 14q32.33. A blue arrow indicates the orientation 5' → 3' of the locus, and the gene group order in the locus. The blue arrow is proportional to the size of the locus, indicated in kilobases (kb). The total number of genes in the locus is shown between parentheses. Nine non-mapped IGHV genes which have a provisional designation are not included in this figure. Croce, C.M. et al., Proc. Natl. Acad. Sci. USA, 76, 3416-3419 (1979). Kirsch, I.R. et al., Science, 216, 301-303 (1982). Mc Bride, O.W. et al., Nucleic Acids Res., 10, 8155-8170 (1982).